Related Series: All Purpose Cultural Cat Girl Nuku Nuku, All Purpose Cultural Cat Girl Nuku Nuku DASH! 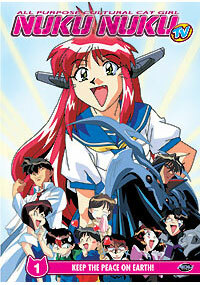 Nuku Nuku and family continue their misadventures as the cat-brained android tries to be a high school student. Hmm. Well, we loved the original Nuku Nuku OAV series, but this continuation seems to be milking a franchise for all it's worth. The plot and characters are dumbed down for kids, especially Akiko, Arisa, and Kyouko with their daily antics fighting Nuku Nuku with various destructible machinery - all in the name of being normal. Seriously. Not to mention the mecha get sillier with each episode. What is this, Pretty Sammy? When Mishima Corporation builds mecha shaped like cacti and worms and other, inane, uninteresting items... You start to ask, why? Still, Nuku Nuku is her peppy, cute, usual self, as her overall catness shines through, and her interactions with her peers at the high school are actually quite funny. If anything, this is the real reason to watch the show. Otherwise, though, with average animation, average music, and nothing really new to introduce besides the high school aspect (which isn't all that new, either), the TV series is far short of what it could have been. Still, it isn't DASH...at least the characters are still recognizable. Recommended Audience: Teens and up seem to be the main audience, though it's pretty much typical Saturday morning fare. Nothing much offensive - or new, for that matter. There's not even fan service.